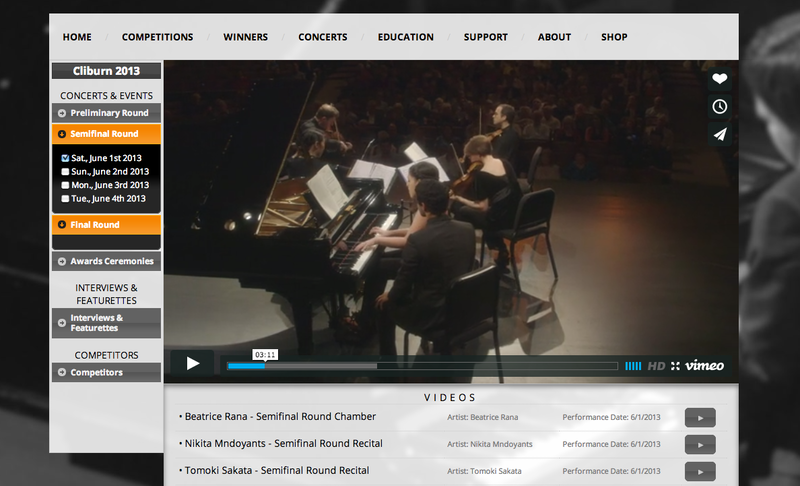 The Cliburn has transformed public engagement through live streaming the competition, and by opening its elite competition to an amateur video category whose winners are selected through public voting. The Cliburn was initially formed to encourage the development of world-class talent in classical piano performance. It offers a highly structured and competitive environment for aspiring young pianists to perform before internationally-renowned judges; medal winners frequently have gone on to major careers as soloists. To foster interest and participation in the competition, the organization in 2013 initiated a series of innovations that vastly expand its reach. The most recent Cliburn Competition featured a multi-camera live webcast, streaming over 13 million minutes of video from the 17-day competition to audiences in 155 countries. In addition to behind-the-scenes, competition, and award ceremony footage, the webcast included interviews, symposia, competitor profiles, and tributes to Van Cliburn. In 1999, the Cliburn added an Amateur competition, next scheduled for 2016, and in 2014, an Amateur Piano Video Contest was added. Competitors uploaded videos through a contest portal where the public could watch videos and vote for favorites. People from 97 countries visited the site to watch performances and cast their votes. In addition to competition-related information, videos, and educational study guides, The Cliburn’s website offers lesson plans and activities for educators to download. In 2014, the Cliburn began live streaming select concerts by competition finalists and in June 2015, the organization held its first International Junior Piano Competition for competitors age 13-17. Creating a bridge between contemporary music consumption and performance, SHUFFLE concerts give audience members the chance to select music performed live from a playlist of over 40 songs. Site content current as of December 31, 2016; no further site updates are planned.